God's living and abiding Word is truth and life and it has power to set us free from every sin and oppression and bring us healing of body, mind, and spirit. If the demons, the fallen angels, were able to be familiar with the power and authority of Jesus, the Son of God, how much more should we be familiar with and believe in the power and authority of the gospel the good news of Jesus Christ, and entrust our lives to the Lord Jesus? The Lord Jesus speaks his life-giving Word to us each and every day so that we may walk in the freedom of his love and truth. If we approach the Word of God with humbleness and humility, and with an eagerness to do everything the Lord desires, we are in a much better position to learn what God wants to teach us through his word. 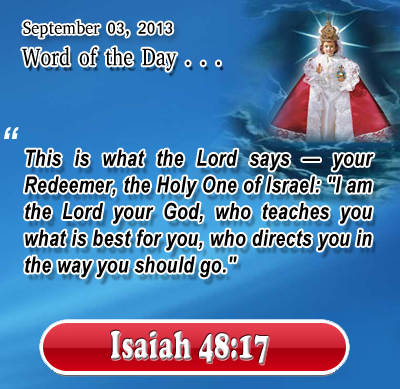 Isaiah 48:17 This is what the Lord says — your Redeemer, the Holy One of Israel: "I am the Lord your God, who teaches you what is best for you, who directs you in the way you should go." O heavenly Father, guide us to the places you want us to be, to the ministries in which you want us to serve, and to the people you most want us to touch. Capture our heart to do your work and never let us lose sight of your coming glory. In Infant Jesus' name. Amen. 31And he went down to Caper'na-um, a city of Galilee. And he was teaching them on the Sabbath; 32 and they were astonished at his teaching, for his word was with authority. 33 And in the synagogue there was a man who had the spirit of an unclean demon; and he cried out with a loud voice, 34 "Ah! What have you to do with us, Jesus of Nazareth? Have you come to destroy us? I know who you are, the Holy One of God." 35 But Jesus rebuked him, saying, "Be silent, and come out of him!" And when the demon had thrown him down in the midst, he came out of him, having done him no harm. 36 And they were all amazed and said to one another, "What is this word? For with authority and power he commands the unclean spirits, and they come out." 37 And reports of him went out into every place in the surrounding region.